Over time, it’s natural for a person’s smile to age. By and large, even those that take great care of their teeth are susceptible to change in their smile. 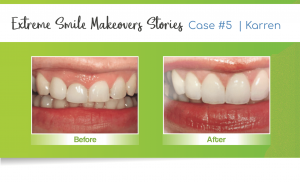 When this happens, many people will elect to have a smile makeover to improve their smile. So, if you’re interested in upgrading your smile, come and see a Lincoln cosmetic dentist at one of our offices. We have many dentists who are experienced in cosmetic dentistry at Nebraska Family Dentistry. They and their team would love to help you. If you’re growing tired of your smile, it’s probably time to upgrade. 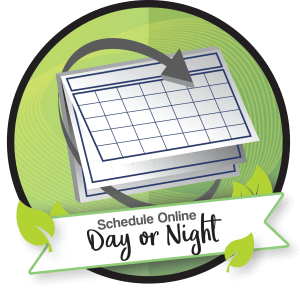 When you’re ready, a Nebraska Family Dentistry Lincoln cosmetic dentist will work with you to develop a custom plan. 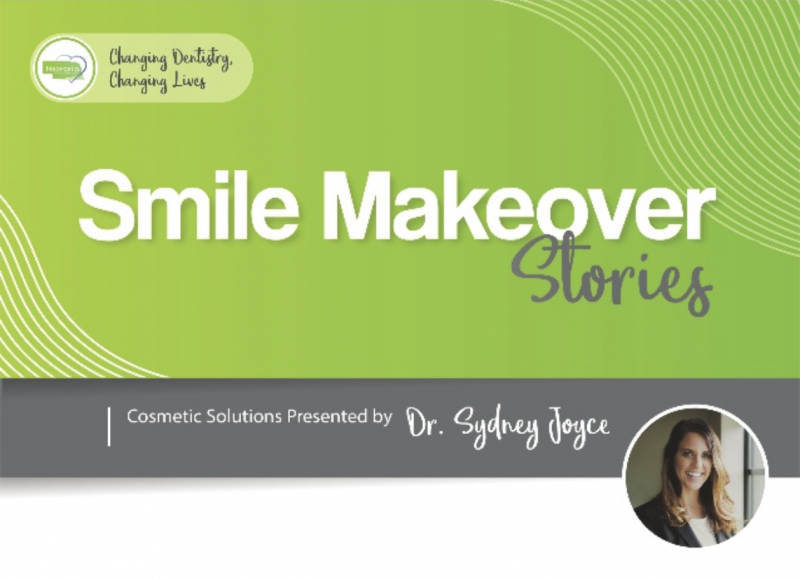 Each smile makeover is different, allowing you to achieve the results you’re wanting and expecting. Every Lincoln cosmetic dentist at our office knows the ins and outs of several cosmetic treatments, including those that require state of the art technique. Based on this knowledge, your Lincoln cosmetic dentist will determine potential solutions depending on what your expectations are. As we go throughout treatment, the Lincoln cosmetic dentist that you feel comfortable with, will work with you to make sure you’re completely satisfied. Even if you’re feeling embarrassed about your smile, a Lincoln cosmetic dentist at our office would be glad to help you get the smile you want and deserve. We serve many patients who are concerned about their smile. We’re eager to help you find satisfaction and confidence in your smile. A Lincoln cosmetic dentist, especially one from Nebraska Family Dentistry, you will find is not new to this profession. In fact, they’ve seen just about everything and you can probably bet that your oral health is not the worst they’ve seen. Ultimately, our dentists delight in helping people get the smile they want, so they can enjoy it. 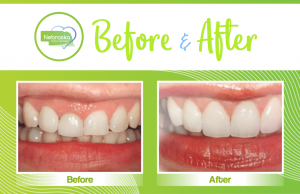 We look forward to taking your smile to the next level. As a part of the oral aging process, teeth tend to become more yellow. While this is a natural process, many of us like to have beautiful white teeth. Generally speaking, our smiles are often a part of peoples’ first impressions of us. Certainly, white teeth can help us feel confident. Professional teeth whitening comes in all shapes and sizes. 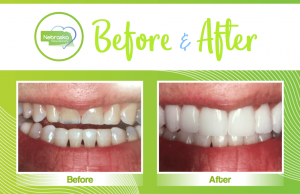 We offer many different kinds of whitening solutions, ranging from dental veneers all the way to in-office whitening trays. Also, we’re able to provide sensitivity-free whitening for those with sensitive teeth. Over time, silver fillings often crack. These silver, or amalgam, fillings expand and contract in your tooth and as a general rule, you are often better off replacing the silver fillings with ceramic fillings. Furthermore, those silver fillings used to be made with mercury, which is known to be harmful to your overall health. Consequently, many choose to have their amalgam fillings replaced. In any case, when you elect to replace metal fillings, we’ll give you metal-free fillings. We’ll use a compound of ceramic materials to give you white fillings. In short, your new fillings will blend right in with your teeth. At a certain age, your teeth become incredibly susceptible to cracks and breaks. In brief, cracked teeth can quickly become a nuisance and even more so, painful. If that isn’t enough, anyone whose teeth are cracked will tell you that they aren’t attractive. Some people find gaps in their teeth embarrassing and uncomfortable. Gaps in the front can feel especially embarrassing, and may even present problems eating or chewing. For some, these gaps can even give your face a sunken appearance, causing you to look older than you are. Nonetheless, we have a handful of solutions for gaps in a person’s teeth as well. Dental veneers will sometimes do the trick in helping you fill the gaps. If not, dental implants are an even better solution, and can even last a lifetime if you take good care of them. If your missing tooth wasn’t knocked out, it’s likely it fell out due to gum disease. Over time, if your gums become infected, they’ll begin to grow loose. Therefore, if that happens, they’ll be unable to hold your teeth in place, allowing them to fall out. It’s also possible to have gum disease if your teeth haven’t fallen out. For this reason, prior to any cosmetic dental treatment, your gum disease will need to be treated. First, your dentist will need to see exactly what is wrong. Specifically, if it’s gingivitis or periodontal disease, your dentist will treat the disease first, providing a sturdy foundation for cosmetic care. We offer a handful of solutions for teeth extractions. However, our best solution by far is called a Hybrid Prosthesis. The Hybrid Prosthesis is a state of the art tooth replacement procedure that places an implant retained bridge in your jaw, which will become natural-looking teeth. Unlike dentures, this implant retained bridge will not need to be removed at all. With this in mind, patients must still treat them like real teeth – they will need to be cleaned by consistent brushing and flossing. 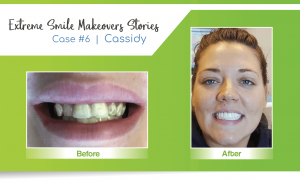 Furthermore, we’re able to do this amazing transformation through our partnership with Nebraska Oral and Facial Surgery. This patient hadn’t visited the dentist in several years. Her teeth had decay present, and the patient felt self-conscious about her smile. 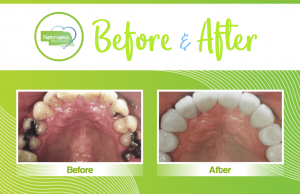 Although she came in thinking nothing could be done, we were able to remove the decay and place crowns over the damaged teeth. 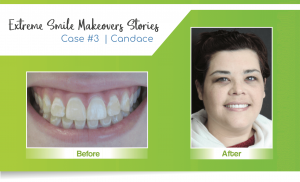 As can be seen, this solution strengthened her teeth and gave her a bright new smile she could be proud of. Severe discoloration and worn down teeth from grinding brought this patient through our doors. 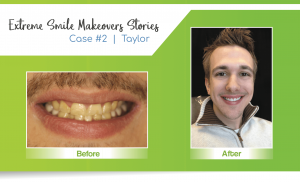 He chose to both whiten and straighten his teeth with an extreme smile makeover. Ultimately, we used porcelain crowns to cap the teeth that were misshapen and we also bleached the teeth. Truly, Taylor’s smile is awesome now! Like many people, this patient grinds her teeth at night. Over time, grinding caused chips, cracks, and uneven teeth. 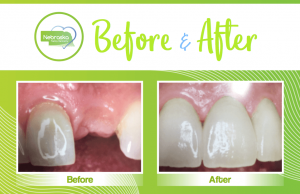 We used dental crowns to strengthen and restore the teeth. We also gave this patient a mouth guard to wear at night, which protects her teeth from grinding. In short, she now has a stunning smile that has left her feeling confident. 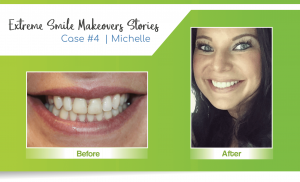 This patient was seeking a straighter, whiter smile after graduating from law school. She wanted to appear more professional. In fact, these results were easily achieved. The secret? This patient now has dental veneers. Here’s a good example of a “gummy smile.” This patient complained that her teeth appeared too short. In reality, she simply had a lot of extra gum tissue, covering the healthy teeth below. Actually, this too was an easy fix. 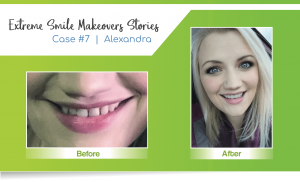 Surprisingly, we used gum re-contouring and dental veneers to give her the smile of her dreams. This patient had undergone cancer treatment and her teeth were negatively affected, causing her to lose all of her teeth. Therefore, we completed a hybrid prosthesis, replacing all of her teeth with multiple dental implants and porcelain bridges residing over the implants. Generally speaking, a hybrid prosthesis is composed of multiple crowns that are connected together. Of course, a hybrid prosthesis will make any smile look beautiful, youthful, and simply perfect. This procedure is also called “Teeth-in-One-Day “ or an Implant Bridge. 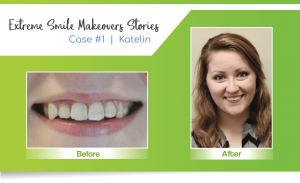 Multiple gaps between this patient’s teeth took a toll on her confidence. 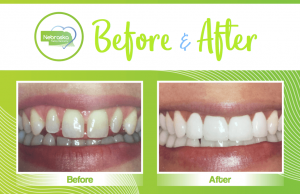 Moreover, she wanted a solution that would be quick and easy, instead of spending years in braces. 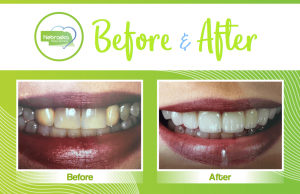 So, with a combination of veneers and professional whitening, her makeover took just a couple of weeks and produced amazing results. Think You’re Past the Point of No Return? Think Again! The cosmetic dentists at Nebraska Family Dentistry have been fixing up smiles for many years now. 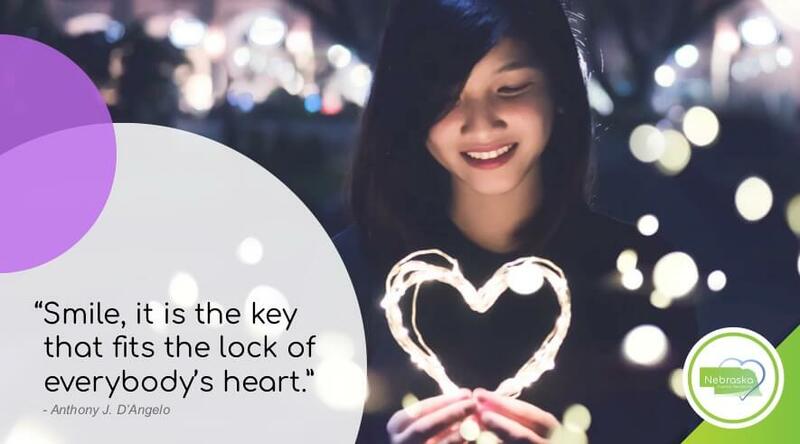 We find great joy in helping people fall in love with their smiles. You can believe that we’ve seen many smiles go from rough to ravishing throughout the years. There’s simply very little that we can’t do! Many of our patients have had bad experiences with cosmetic dentistry before coming into our care. For this reason, we take great pride in our ability to help patients be satisfied. Dr. Alderman and Dr. Joyce are just two of our cosmetic dentists who offer great cosmetic care to our patients. Definitely, give us a call today if you’re thinking a smile makeover might be a good option for you! All of our locations offer excellent cosmetic care that will leave your smile looking pristine. In the long run, you deserve to be happy. For this reason, we’d be more than happy to talk to you about the possibilities. We look forward to meeting you! Obviously, there are a very few things that we find more fulfilling than creating great experiences for our patients. Schedule your free, complimentary consultation today!